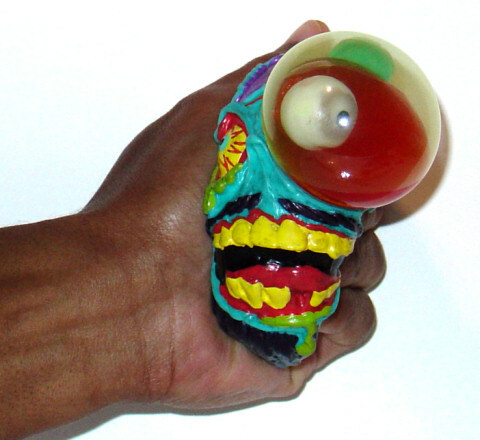 Scary-Crayon reviews... MADBALLS 2008 Series 2!!! If you haven't noticed by now, Scary-Crayon just can't get enough of those gross, zany, and obnoxious Madballs! I'm running out of clever ways to introduce these Madballs articles (typically I just list the Madballs pieces we've done so far, but a simple link to the search output with the appropriate query will suffice for all past, present, and future Madballs features), but suffice it to say that few people were as excited as I was when the Madballs returned to the pegs at Toys 'R' Us last holiday season. 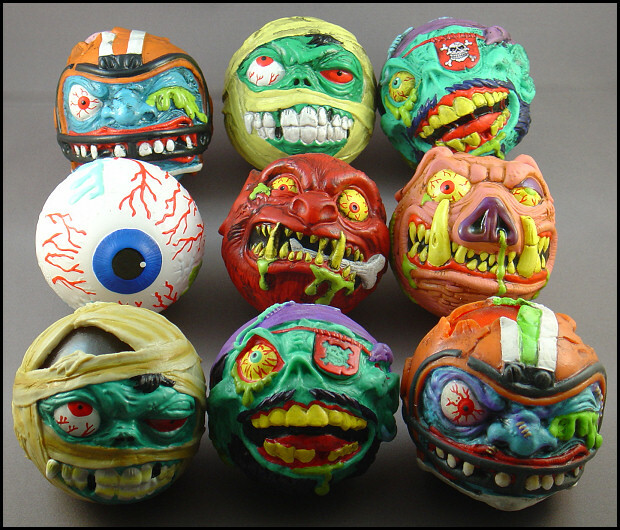 Well, now that we're running in 2008, I'm even more excited to be reviewing the Series 2 Madballs! They're not currently on toy shelves -- so don't go nuts looking for them just yet -- but they are being unveiled at Toy Fair 2008 this week. 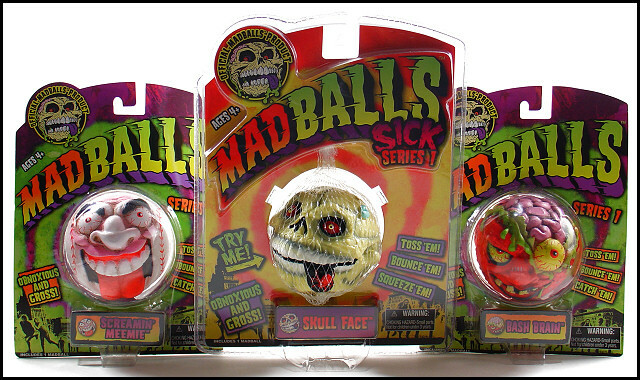 And since the folks at Basic Fun were kind enough to send over an advance set of the Series 2 regular and Sick Madballs for us to review (thanks a bunch... a bunch of Madballs! ;)), we're giving you an early review and assessment, complete with comparisons to the 1986 releases! Admittedly, I didn't own many of the original Madballs represented in this latest wave, so I'll be linking to online images and artwork from Bobby's Madballs page where necessary. Hopefully seeing these pictures and reading my comments will help you to visualize the differences between the originals and their modern counterparts. Also, as advance preview Madballs, most of these guys hadn't been packaged yet (not to mention that my light tent setup isn't large enough to accommodate multiple carded toys, so cool group shots wouldn't have worked anyway) -- only the Sick versions of Blechbeard and Dust Brain arrived on cards. 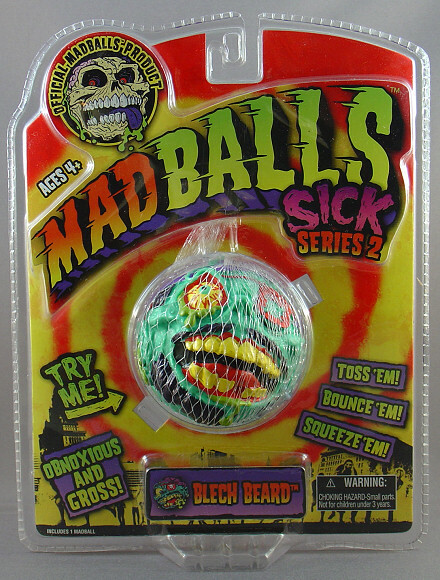 Yet if comparisons to the Sick Series 1 balls (see Skull Face here) are any indication, the packaging for the Series 2 balls should be almost identical to that of the first wave. However, there is one notable difference between the Sick Series 1 and 2 'balls that bears mentioning. Whereas the first wave has the balls contained completely in nets -- thereby allowing for much fondling and squeezing in accordance with the "Try Me!" directive -- the second wave has them encased in nets and held in place by a wide plastic cuff. It's good in the sense that the 'balls are better protected and will theoretically be more difficult to steal (as well as open; whereas the Sick Series 1 Madballs were surprisingly simple to retrieve -- just cut the net -- the kiddies will almost certainly need help recovering the Sick Series 2 'balls), but it makes it all but impossible to squeeze them. 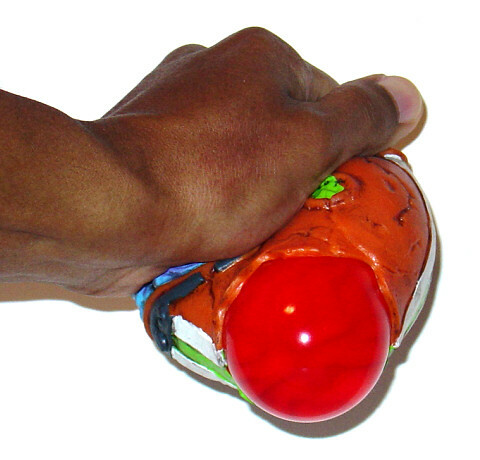 And while I don't mind that so much -- I've always disliked the idea of someone else playing with my toys before I even open them, so I've never been a huge proponent of "try me" packaging -- a package that invites kids to try out the toy really shouldn't be designed to prevent them from doing so. 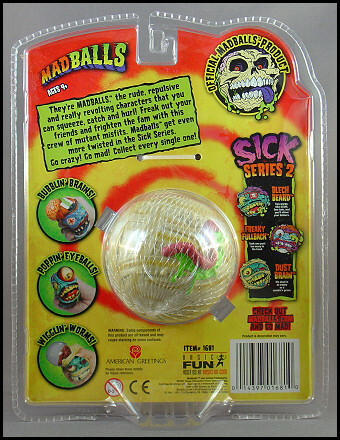 That said, it's entirely possible that this packaging problem will have been rectified by the time that the Sick Series 2 Madballs show up in stores. First up is Swine Sucker. 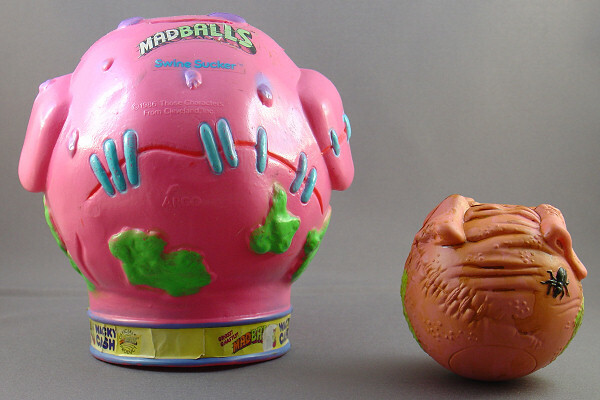 Like many of the original Series 2 Madballs, I didn't actually own him -- but, as you see here, I did have a piggy bank bearing his likeness. (Even Madballs products made use of puns!) There have definitely been some significant changes to the character's appearance since 1986. The colors are more or less the same, and he still has his slime "beard" of sorts, though now Swine Sucker sports a more realistic pink and a less garish green. In addition, as evidenced by the extremely yellow teeth and visible cavities, he apparently hasn't brushed in the last 22 years. Along with Swine Sucker's dental hygiene, he's lost his purple warts and blue stitching. Admittedly, I miss these details, as they did help to make the toy more visually interesting. And whereas the original sported a sort of foaming wild boar look -- as if he'd rush headlong into danger (as if a Madball could rush any other way!) -- the lazy left eye on the new Swine Sucker gives him a slightly more relaxed look. Granted, the bloodshot eyes definitely mark this Swine Sucker as mad, but he also wouldn't look out of place wallowing in the mud or watching football on a lazy Sunday afternoon. He vaguely reminds me of Uncle Stinky from Tiny Toon Adventures: How I Spent My Summer Vacation. So which design is better? 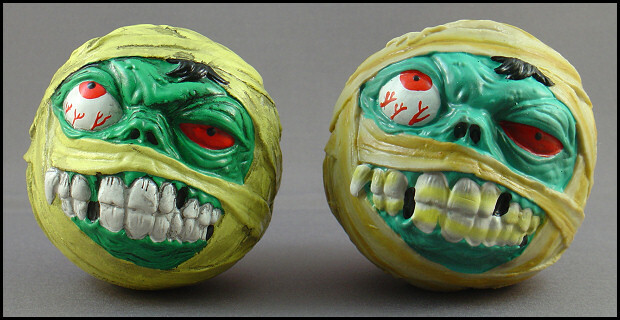 I can't really say that one decidedly trumps the other -- I definitely dug the purple warts, blue stitching, and wild eyes of the original Swine Sucker, but this lazier SS with his pearly yellows is also a great reimagining that imbues the Madball with a not unwelcome amount of personality. 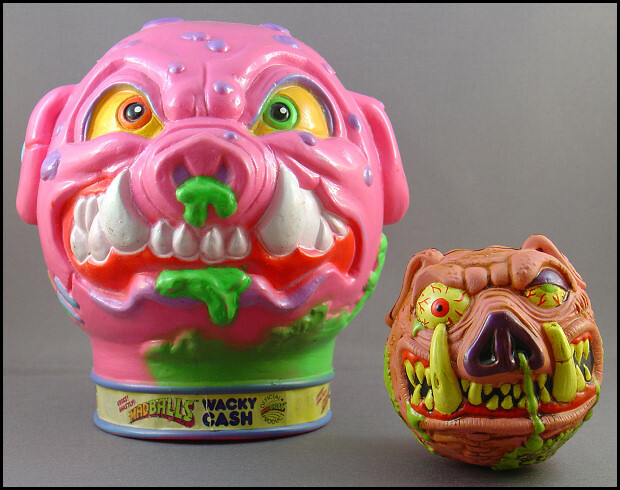 Even though the lazy left eye doesn't accent the different colored eyes of the character as well as the original, Swine Sucker is definitely my favorite updated design out of the original Madballs represented in this second wave. The new Wolf Breath, on the other hand, I do not like at all. Incidentally, it's not for the reason I expected to hate him. When I saw the Series 2 concept art on Madballs Central, I was really, really bothered by that bone sticking out of his mouth. I have no idea why it bugged me so much, but I couldn't stand it. I hated it intensely. Now that I have Wolf Breath in hand, however, the bone isn't quite as irksome -- maybe because it's wholly overshadowed by an even greater flaw. That flaw? The horrible, horrible color scheme. See, the original Wolf Breath, seen above in the (broken) head popping variety, had sort of a Wolfman vibe to him. Even with the somewhat uncharacteristic purple lips, red/orange nose, and green and orange eyes -- all of which, in my view, contributed to the visual intrigue of the toy -- the other colors ensured that he was seen as having a vaguely humanoid face covered by fur. The blood-covered fangs were perfect. And while I could understand if, in this day and age, the blood was a bit much for a toyline marketed towards kids age four and up, I have no idea why they decided to paint this Wolf Breath in an almost uniform earth red -- especially since he's not colored that way in the concept art. If they couldn't have used a more fur-like brown, even black and grey would have made more sense. At least real wolves sport those colors on their coats. As it stands, Wolf Breath looks more like some skinless half-human Cerberus thing from the Resident Evil films... which would have been fine (though less than ideal) if his coloring had been intended to represent muscle and meat. But judging from the shaved portion on his back, it was clearly supposed to be fur. Lame. Anyway, aside from that one glaring flaw -- which is unfortunately impossible to ignore because it covers almost the entire Madball -- the sculpt seems to be pretty decent. It's a shame, really. I don't dislike the updated Oculus Orbus nearly as much as the new Wolf Breath, but I do have some minor misgivings about him. One of the most appealing things about the original OO was that the toy was so clean. The others had stitches, dripping slime, blood, what have you... and Oculus was just a bloodshot eyeball. In fact, that was the whole point of him. 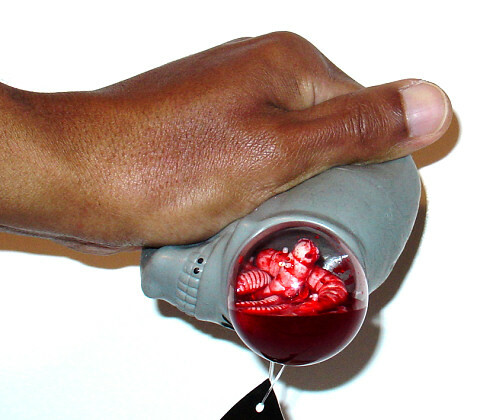 His individual tagline even read: "A big, bloodshot eyeball to freak out your friends!" Beautiful. If I could come up with an effective pun relating Oculus Orbus to Occam's razor, it would be entirely in keeping with the perfection of his original simplicity. 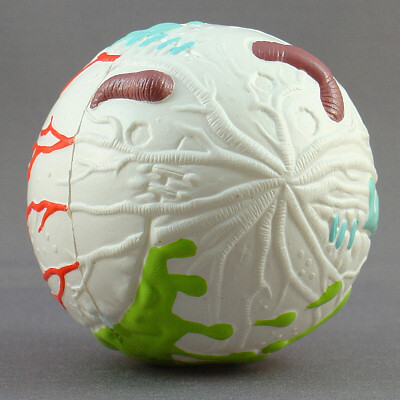 But simple bloodshot eyeballs are hardly novel among gross and horror-themed balls these days. Note that the ball on the left in the above image isn't even an official Madball or even an obvious Madball wannabe: it's just a bloodshot eyeball that I picked up a few years ago because it reminded me of Oculus Orbus. So in light of the ordinary nature of the original design, I can completely understand wanting to nasty ol' Oculus up a bit to make his latest incarnation stand out a bit. And really, it's not that distracting. I think the green slime is a bit excessive, but I've even warmed to the blue stitching. Still, if I have to call Oculus out for something, it'd have to be for the fact that, although his details run all the way to the back of the ball, they apparently stopped painting the veins at the central seam. 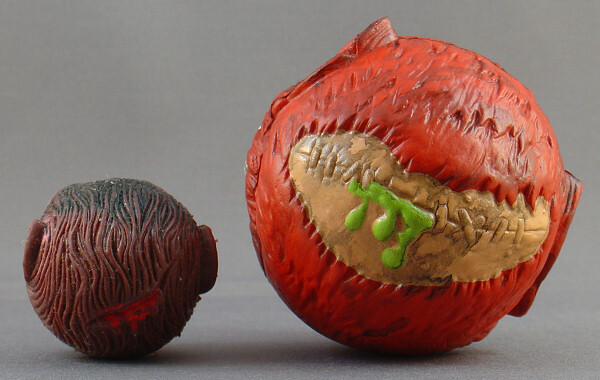 I'm not sure whether this flaw is unique to the pre-release version -- which will presumably be displayed facing front at Toy Fair '08 -- but it does seem odd that these details went unpainted while the slime, worms, and stitching got some rear applications. I never had the original Dust Brain in any incarnation for reasons discussed in this old article. 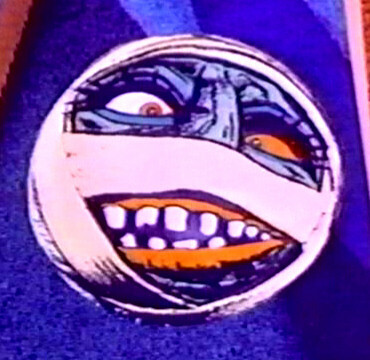 Even though Dust Brain was presented as male in the toyline and print media, the animated Dust Brain was female -- and, for whatever reason, I almost wholly subscribed to that lame "boys can't own girl characters" rule as a child. (My sister did have a knockoff Dust Brain, but heck if I know where it is.) Anyway, you'll just have to hit the Google and browse eBay auctions and look at this package art for the old toy and take my word for it -- this new Dust Brain looks a lot like the original. Not that that's entirely surprising, since it's just a green-skinned mummy, but still. In fact, with such neat little details as the red eye being decidedly squintier than the "normal" eye and the visible hair sticking out from beneath the bandages, I've got to say that the revised Dust Brain is superior to the original design. It's definitely cool to have intriguing reinterpretations like Swine Sucker, but it's also important to make improvements where possible and not to mess with perfection where you find it. The new Dust Brain perfectly embodies the latter approach to updating designs. 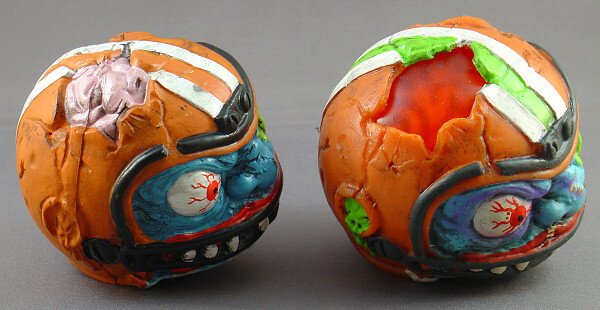 Dust Brain also represents an improvement within the Madballs line itself. 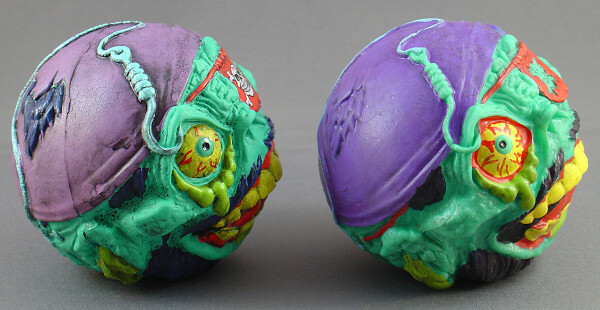 I mentioned last time that I wasn't entirely keen on the Sick Series 'balls because the action feature -- and the way the toys were sculpted to accommodate them -- resulted in two out of three of the Sick Madballs looking decidedly less attractive than their regular counterparts. Here, however, they're almost identical. (The normal version is on the left; the Sick version is on the right.) 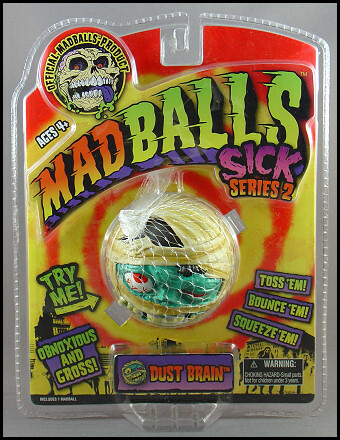 I attribute this to the fact that whereas the Sick Series 1 Madballs' features were mostly tied to really prominent areas of the toys (Slobulus's eye and Bash Brain's brain), here they're tied to areas that don't immediately demand your attention when you look at the characters. Heck, in the above photo, you can't even see the feature area on Dust Brain. And while admittedly there are some minor paint differences between the two -- here, the normal DB has an effective black wash that his unwell counterpart lacks -- it's nowhere near significant enough to deter a consumer from buying the Sick version. The Sicky even tries to make up the deficit with two-toned bandages, which really ends up working quite well. Anyway, here's what happens when you squeeze Sick Dust Brain -- you get a bulge from his head and can see worms and blood. Granted, this feature doesn't do a whole lot for me, as I've seen generic dollar store balls that do the same thing and manage to look just as gross (if not grosser) in the process. Still, it works well with Dust Brain, and the fact that it doesn't detract from his appearance in any significant way makes it worth the extra buck for fans of the sickness (even if mummies probably wouldn't have worms in their heads). 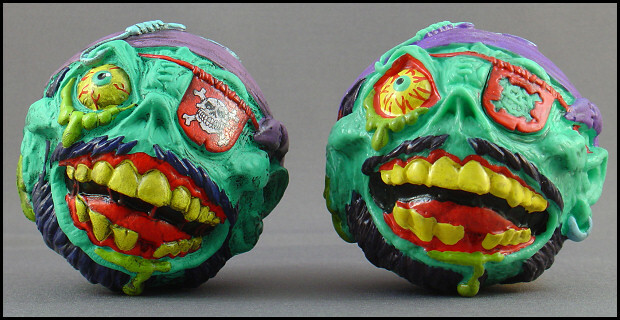 Freaky Fullback is another Madball that I didn't have as a kid, but a Google image search and the package art from the 1986 version reveal that, like Dust Brain, he's pretty faithful to the original. (If it's possible to judge accurately from the tiny pic that shows up in the Google search, I'd wager that he looks even better, too.) I'm also once again impressed by how much alike the normal and Sick versions look -- in fact, the Sick version actually manages to look better, what with additional paint applications for the central stripe, the slime leaking from the ears, the hair hanging down behind the back of the helmet, and purple bruising across the face. Unfortunately, Freaky Fullback's bulging brain doesn't work half as well or look half as good as either of his companions' Sick features. 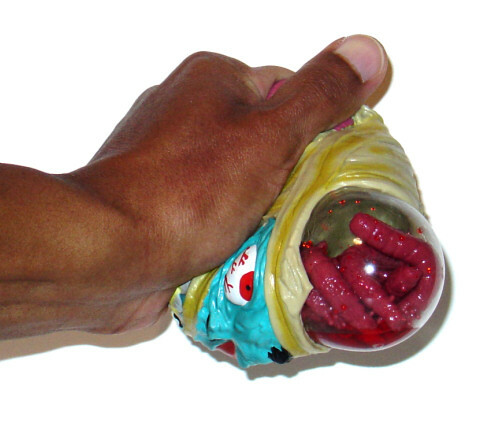 Unless you do a lot of wiggle work to get the brain thingy inside there into a more prominent place, it just looks like a clear red bulge -- and even with it in position, it's still not as attractive as Dust Brain's worms or Blechbeard's eye. 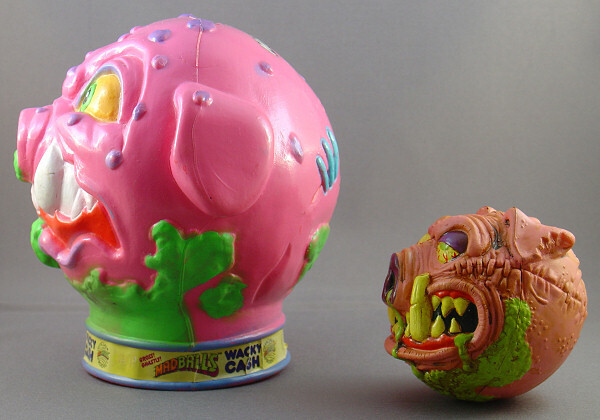 It's also the one area where the normal version of Freaky Fullback is clearly superior, as the sculpted pink brain bulge looks much better than the thick noodle casserole largely obscured by its red casing. Still, given that the Sick Series Freaky Fullback sports a superior paint job (and is just a tad larger than the normal version, which is appropriate for the character given his apparent football position), I actually prefer the Sicky to the normal version despite its shortcomings. And finally, here's Blechbeard in normal and Sick varieties. I don't have a 1986 version of him to compare to the new toys because he's an all new character, but he does strongly resemble Bruise Brother from the original Madballs Series 2 roster -- so, at least for me, that he's not Bruise Brother makes him something of a disappointment. It's not so much that he's new (and in this case, while I do like Bruise Brother, I'm not nearly as upset with him being replaced as I was about Aargh), but rather that he's "new" while being so similar to one of the original Madballs. I mean, why remake Bruise Brother if you're not just going to call him that? To be sure, there are differences. Bruise Brother was more in line with a grungy biker and/or Mad Max-style road warrior. Blechbeard, on the other hand -- judging from several details and his package description, which reads, "Two words: Sea Scum. One look, and you'll shiver your timbers" -- has a sort of pirate theme to him. It'd be easy enough to confuse him with a biker, though. Much of what we associate with pirates requires a body -- hook hands, peg legs, parrots perched on shoulders, cutlasses dangling from the hip, et cetera -- so it's arguably easier said than done to make a distinctly pirate-like Madball. The fishhook over the eye, the do-rag, and the skull and crossbones eyepatch certainly help. But a biker could just as easily sport the latter two: it's worth noting that Bruise Brother also wore an eyepatch and had a skull and crossbones symbol on his helmet. What about some seaweed? A gold tooth? A do-rag with coloring and/or designs more in keeping with our image of pirates? Maybe even a Sick feature that revealed his head to be full of hermit crabs and fish? And while I imagine that the blue skin is meant to suggest that he drowned at sea, I'd have preferred him with a more "normal" skintone and maybe a blue beard or other hair detail that referenced a particular pirate in some way. Details like this would've gone a long way towards establishing Blechbeard as a bona fide scourge of the seven seas rather than a pale Bruise Brother imitation. That said, kids today probably won't know a thing about Bruise Brother -- and on its own merits, the toy isn't half bad. The Sicky Blechbeard isn't nearly as impressive as Dust Brain and Freaky Fullback when compared to the regular one, as his fishhook, skull and bones insignia, and hair protruding from the top of the do-rag are noticeably unpainted, but he does boast the coolest Sick feature yet in the new Madballs line. While I personally would've preferred tiny crabs or something else appropriately sea-themed, squeezing the Sick Blechbeard causes his eye to pop out from behind his eyepatch. Granted, one would expect him to be lacking said eye -- pirates wear patches because they've lost the eye, don't they? -- but it's still a fairly unique feature, especially since it's cleverly hidden by the eyepatch on the unsqueezed ball. I had a bit of a problem with my Blechbeard where the eye would frequently get stuck outside the ball and require me to push it back inside manually, but other than that I was really pleased with it. So while my problems with the character design make it tough for me to enthusiastically recommend Blechbeard, he's good enough to warrant getting either version for kids. 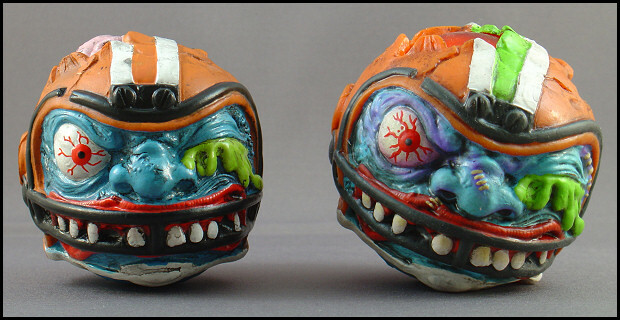 Moreover, despite the fact that I like Dust Brain and Freaky Fullback far more than Blechbeard, the relative uniqueness and effectiveness of his bulging eyeball feature is enough for me to say that -- if you can only grab one Sick Series 2 Madball -- Blechbeard is undoubtedly the one to get.